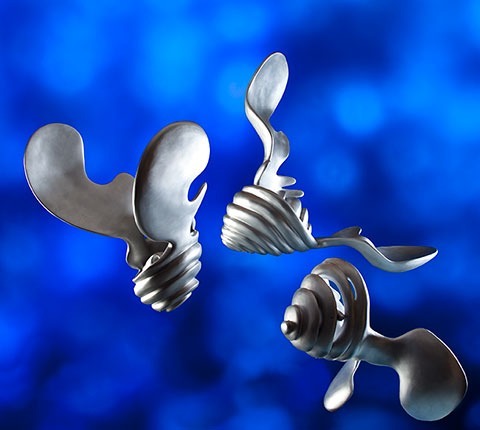 THE PTEROPOD PROJECT: charismatic microfauna was an exhibition of 11 sculptures inspired by pteropods, microscopic mollusks near the bottom of the marine food web that are threatened by rising levels of ocean acidification. Evocative of Arp, Miro and Kandinsky, Kavanagh’s pteropods are highly abstracted and enlarged some 400 times. Collaborating with biological oceanographer, Dr. Gareth Lawson at the Woods Hole Oceanographic Institution, Kavanagh celebrates the beauty of these fragile microorganisms while raising consciousness about their potential demise. THE PTEROPOD PROJECT: charismatic microfauna is dramatically captured in a 40-page book that contains photos of all sculptures, along with an essay by the artist, and noted art historian Stephanie Grilli, who positions the sculpture in the context of 19th and 20th Century scientific discovery and artistic exploration. It also contains timely information and graphics on the science of ocean acidification.